Over the past few decades, Virginia’s wine industry has exploded, going from almost insignificant in the ’80s and ’90s to being the fifth largest both for overall acreage and grape production in the nation as of 2012. Beer, too, has gone through an explosive boom period, with craft brewers both large and small opening their doors all across the state. But what of distilleries? How are they faring in the Commonwealth? Well, it turns out that in 2005 there were only a handful of distilleries in all of Virginia. Today, there are more than 35 in the state, with still more waiting in the wings. This trend is a reflection of what’s happening nationally—while there were only about 40 distilleries nationwide in 2005, there are more than 900 now, with more opening or getting ready to open every year. So how has this trend manifested itself in Virginia’s Piedmont? For an answer to that question, we decided to take a drive. It would lead us over 90 miles of glorious country highways from Manassas, through Culpeper, and on out to Sperryville. Along the way we would visit four craft distilleries that together represent the entire range of the state’s offerings—distilleries old and new, modern and rustic, scenic and urban. We would sample a full range of spirits, as well: gin, whiskey, vodka, rum, even moonshine and some clever cocktails. 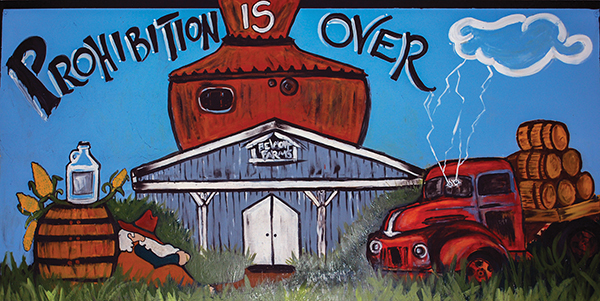 We would learn, in short, that there is a lot to learn—and love—about Virginia distilleries.